This recipe appeared in the August 2010 issue of Texoma Living!. Heat oven to 350 °. Form the pie crust into the tart pan. Dock crust with fork. Place in oven 10-15 minutes or until browned and completely cooked. Don’t allow it to puff. You may line dough with parchment and use pie weights or dried beans, if you wish, to prevent dough from puffing. Remove from oven when brown and let cool on rack. Heat milk in saucepan over medium heat until scalded. Mix flour, sugar, and salt together and add to milk mixture, stirring constantly until the mixture thickens and boils. Once the mixture thickens, temper the yolk by adding a cupful of the milk mixture to it, stirring the whole time. Add the yolk mixture back to the milk mixture, and cook and stir one minute. 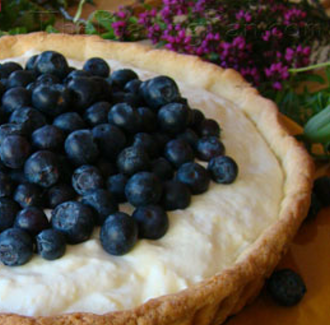 Pour into baked tart shell and allow to cool in refrigerator, overnight if possible. Before serving, unmold tart shell to a plate and arrange raspberries or strawberries in two or three concentric circles around the edge of the shell. Then make a center circle of blueberries. Slice and serve with plain cookie on the side. Grayson County’s Shangri-La, a special place to escape the terrible heat of a Texas summer, may have been—at least for the privileged—a private paradise known as Chapman Park.